Equipment used for the road widening include Caterpillar skid steers, loaders, excavators, motor graders, compactors and dozers; Link Belt cranes; Roadtec spreaders, brooms and milling machines; Hamm compactors; and more. Last November the C.W. 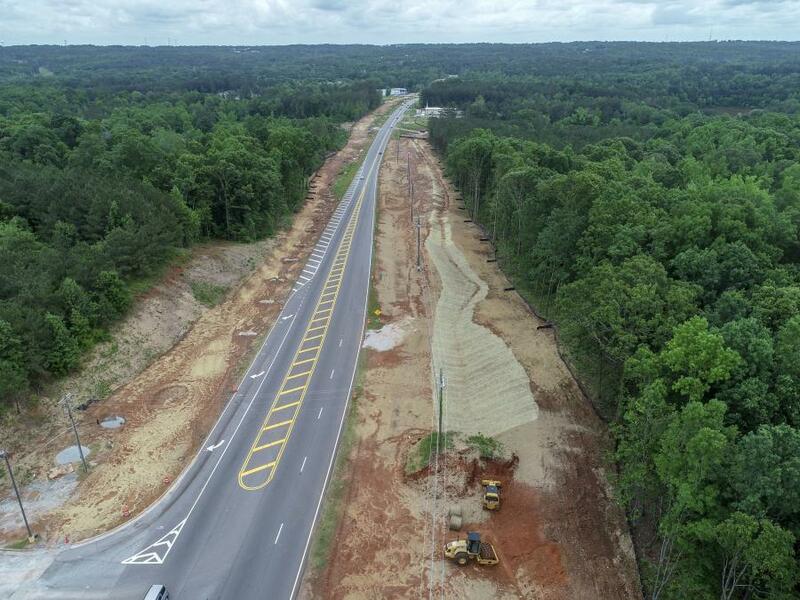 Matthews Contracting Company Inc. began work on the multi-year, $51,173,350 widening and reconstruction of State Route 92, a Georgia Department of Transportation (GDOT) project that begins at Malone Road in Douglas County and goes north to Nebo Road in Paulding County. The Paulding County portion of the project is 5.65 mi. and the Douglas County portion is 1.28 mi. The completion date for the project is July 31, 2022. This stretch of SR 92 carries approximately 23,200 vehicles per-day. The project, which has been in the planning stages for many decades, is intended to meet a transportation need that has been growing. 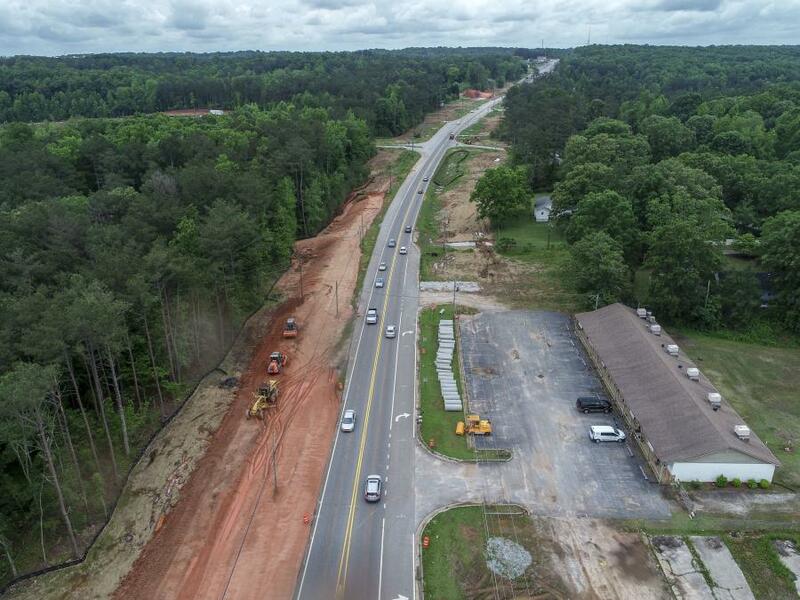 “With the increasing population growth in Douglas and Paulding Counties over the last few decades, SR 92/Dallas Highway has become a major transportation corridor for vehicles traveling between the two counties, especially to gain access to I-20,” said Arafa. “The SR 92/Dallas Highway corridor is the only direct corridor between the cities of Hiram and Douglasville and one of only three travel corridors between Paulding County and I-20. The traffic management plan has been designed to maximize the construction activities and keep traffic flowing. There will be ample day and night work, including weekend work. Single lane closures on weekdays last from 9 a.m. to 4 p.m. and 7 p.m. to 7 a.m., with various hours on weekends. Thus far C.W. Matthews has completed the following aspects: cleared and grubbed about 75 percent of the area for the widening, which was halted due to the federal requirements for Protected Species; installed all the initial erosion control items; placed some of the storm drain pipe; and continued coordination activities with various utilities for relocation. The benchmarks for the remainder of the 2018 construction season are Stage 1 construction for the roadwork and utility relocation. When the work switches into high gear, there will be multiple work sites and the number of construction workers will increase from five presently to an estimated 25-50 later on. The utility companies are self-performing their relocation work, but are coordinating that with C.W. Matthews in regards to prioritizing where they can. Crumbley, who has managed many GDOT projects, appreciates their understanding when problems arise that can delay progress. The plan of attack for the road work has crews building the new northbound lanes first. To accomplish this, crews will construct some temporary asphalt widening on the southbound side to push traffic over to allow for construction of the northbound side. Once traffic is shifted to the new northbound lanes, construction of the southbound lanes can begin. “Contractors would love to be able to construct projects in a linear fashion, meaning starting at one end and building it as you go,” said Crumbley. “Unfortunately, utility issues, time constraints, or other isssues out of the control of the contractors makes us appear to be jumping around. Sometimes we have to do whatever it takes to complete the project in a timely manner. Paulding County has received above normal rainfall since January, which has accounted for the fewer employees on-site. The plan is to make up for the lost days by doubling up crews and working on all available days when applicable. The bridges, mainly three lanes in each direction, each differ in how and what will be constructed. The first bridge — three spans, 165 ft. wide and 210 ft. long — is a total replacement. The second — seven spans, and 280 ft. long, will be widened by 54 ft. and is being raised approximately two ft. by removing the bridge deck and installing reinforced pedestals with new concrete beams and a new bridge deck. The third — three spans and 200 ft. long, will be widened by 30 ft. on both sides. The ready mix is being provided by various vendors, while C.W. Matthews will provide the asphalt from its own ASTEC HMA plants. The contractor will be self-performing about 60 to 65 percent of the work, including grading, pipe laying, placing GAB, producing and placing asphalt, and building walls, bridges, and all the concrete flat work. “The only things that we typically subcontract out is for specialty items such as guardrail, striping and traffic items,” said Crumbley. The main subcontractors are Adams Grading Co. Inc. for clearing and grubbing, Curtin Trucking & Drainage for temporary barrier walls, GTG Traffic Signals, Peek Pavement Markings for striping, SEED for all our erosion items and grassing, Martin-Robbins for the guardrail, Pine Valley and Blount Samford for Concrete Barrier Walls and Anatek Inc. and Cmyco7 Inc. for various metal/steel bridge components. Within the site, crews will be moving around 360,000 cu. yd. of on-site dirt that will be excavated, with another 280,000 cu. yd. brought in from borrow pits. About 85,000 tons of asphalt from the existing roadway will be removed and recycled. CWM utilizes their own fleet of milling machines. The plants will produce and crews will install approximately 157,750 tons of HMA. The concrete beams for the bridges, a total of 7,622 linier ft. of beams, are being provided by Standard Concrete Products, a local supplier. On the SR-92 project, the crews will be utilizing equipment such as: Etnyre asphalt distributors; Caterpillar 279D and 226B skid steers and multi-terrain loaders; Caterpillar 235F, 335F, 349E and 308E excavators; Link Belt Cranes (RTC8050 50 ton rough terrain and LS218 100 ton crawlers); Caterpillar D3K, D4K, D6K and D6N dozers; Caterpillar 930K loaders; Caterpillar 12M2 motor graders; Roadtec RP-190E asphalt spreaders; Roadtec SB-2500 and Weiler E-2850 material transfer devices; Cat CB-54, CB-64 and CW-14 asphalt compactors; Cat CB-54, CB-64 and CW-14 asphalt compactors; Hamm HD140 and HD90 asphalt compactors; Cat CP-56B and CS-56 compactors; Hamm H11iXP and H11iX compactors; Roadtec FB-100 brooms; Roadtec RX-600 and RX-900 milling machines; Wirtgen W250, W210 and W200 milling machines; and Gomaco concrete pavers. “Our primary equipment vendors are Yancey Bros. Co. for all our Cat needs; Tractor and Equipment Co. for Hamm, Entnyre and Wirtgen; MHC / Kenworth for our heavy trucks; Wade Ford for our pick-ups; Atlantic & Southern for our Linkbelt Cranes; and Roadtec for much of our paving equipment,” said Faress. CWM's fleet of fifteen Maintainer lube trucks is used not only to deliver fuel and DEF, but also to perform preventative maintenance on its fleet of mobile equipment throughout north and central Georgia. CWM uses Caterpillar's Product Link and its Visionlink interface to effectively manage its fleet. With four more years of work to complete, Crumbley knows that his crews will meet the deadline. Crumbley stated that the key players for CWM are David Cauble, the general superintendent over the project; Lee Mims, the project engineer; and Brandon Hanson, the project superintendent, all of whom have considerable experience in the industry and are long-term employees of the company.